The news from the library is very bad. I owe $140!! Yesterday I finally took the plunge and loaded up a tote bag with all the books I thought I had out. 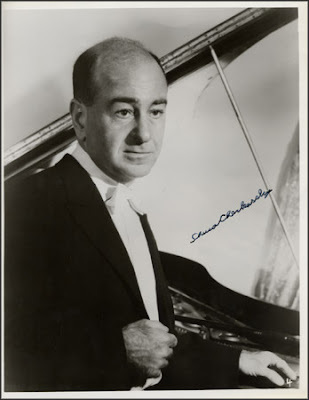 All this happened because there is this book on this pianist Shura Cherkassky I found out about and I was griping about having to shell out for it on Amazon. When my book on Leonard Pennario comes out I do not want it to be so expensive! I want it to be within reach of the common person, like me. Howard said, "Maybe it's at the library." I said, "Well, I can't borrow it from the library because I owe them too much money and I have too many books out." "Why don't you take the books back?" Howard suggested. I had never seriously considered that. The situation seemed too hopeless. But I went upstairs and got a bag and I started loading books into it. It was so dramatic! Almost like when I went back to Confession after 20 years. There was this biography of Leonard Bernstein. God knows why I had borrowed that. I do not even like Leonard Bernstein or this biography and it had nothing to do with my book. There was also a biography of Judy Garland. In which was one page about Pennario. That is unusual! No books mention Pennario. That is why I mention him so much. I am making up for all this. I scanned the page and then I put the book in my bag. ... "My Young Years" and "My Many Years." 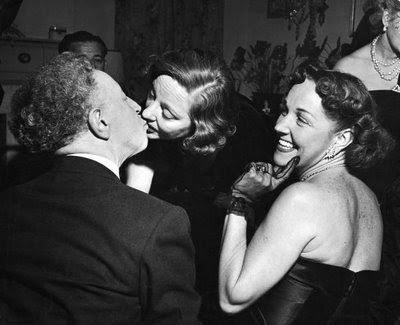 That is Rubinstein in the picture above, kissing Tallulah Bankhead. I put it on my, ahem, Music Critic Web log last week and it caused quite a ruckus. I don't know why. It is not my fault that whereas Pennario kissed Elizabeth Taylor, Rubinstein was reduced to kissing Tallulah Bankhead. Tallulah was a good actress and my dad loved her but it was not like kissing Elizabeth Taylor. ... kissed. I wonder if that is covered in the book about him. After all this trouble I am going through to get this book I sure hope it is! After work I went and returned all my library books and that is when I learned I owe $140. And not only that, there are three books I still have to return. The good news is, it actually felt nice getting all these books out of the house. Who needs Leonard Bernstein kicking around under the bed. Howard said: "We don't have to keep them now." That is a good thing! We have way too many books. Howard said, "Let them keep them at the library, and they can organize them, and when we need them we will know where they are." Can we get the library to keep all our other books, too? It might not hurt to ask. The last time I tried to donate brand new, read once, still selling for full price books at the Central Library like I used to (granted, at the library on Grant that is now closed) I got a snotty "there's no one here to enter them into the system anymore" remark. So I donated them to a used book sale. I wonder who enters the ones they had to pay for? I could catalog your books using the Library of Congress system, and label them with call numbers... for a fee. You provide materials and shelving. I once did that to my own books, just for fun. But now they're all messed up again, and packed away in boxes. Larry, thanks for the sympathy! Mark, the woman with her hand on her cheek is the gossip columnist Hedda Hopper. I bet Rubinstein will get to her next! And Ryan, how much? I might take you up on that. Watch out what you say to me. Hey, I could use a second job. I need to pay for new water service for my house. The starting rate for librarians in Erie County is around $16.50/hr. I'll give you a $1/hr. discount for my lack of master's degree. There's something that a lot of people aren't aware of. 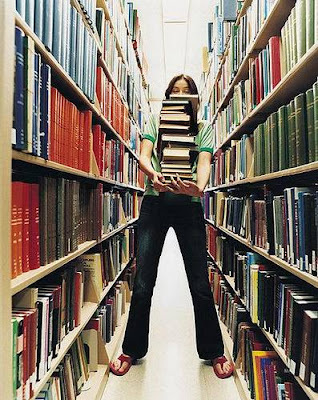 To be a librarian, you must have a master's degree in library science.